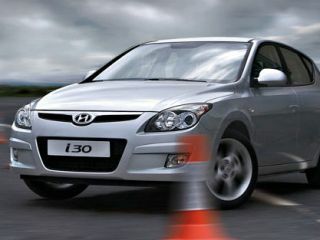 The Hyundai i30: your next car? Car manufacturer Hyundai has come with a novel way to promote its new i30: record sounds from it and then set up a competition that requires the public to remix them into a full track. It's an interesting challenge for sure, and one that has a significant four-wheeled carrot attached to it. First prize, naturally enough, is a Hyundai i30. If you fancy giving it a go, head over to the 30Beats website and download the sample pack. This contains 57 WAV files, each of which is a recording of a sound from the i30. A quick listen to the previews indicates that you get clicks, buzzes, honks and whirrs from all over Hyundai's new motor. Your task then is to turn these sounds into a complete track. The rules state: "You can do anything you like with the sounds even refining them to make them sound totally different but remember we are looking for mechanical music so you probably wont win if your track does not even sound like a car anymore!". You can also make a video for your remix, though this is an optional element of the competition. Once your track is finished, you have to upload it to YouTube and send the URL to 30Beats via a form on the website. The winner of the competition will be chosen by the public after it closes on 1 October (it's open to UK residents only). If you're looking for inspiration, here's the first official entry.